After numerous autumn holidays in the Canary Islands we decided on a complete change for 2015 and booked a two-week break at Vritomartis, our first visit to the beautiful island of Crete. After a scenic trip over the cloud shrouded mountains from Chania we glimpsed our destination far below – Vritomartis, an oasis in the beige barren landscape. The friendly welcome and thirst quenching orange juice gave us an early taster of the kindness of the Sfakian people that we would experience over the next two weeks. Our bungalow was beautifully located with stunning views from the balcony of the sparkling Libyan Sea and the island of Gavdos is the distance. 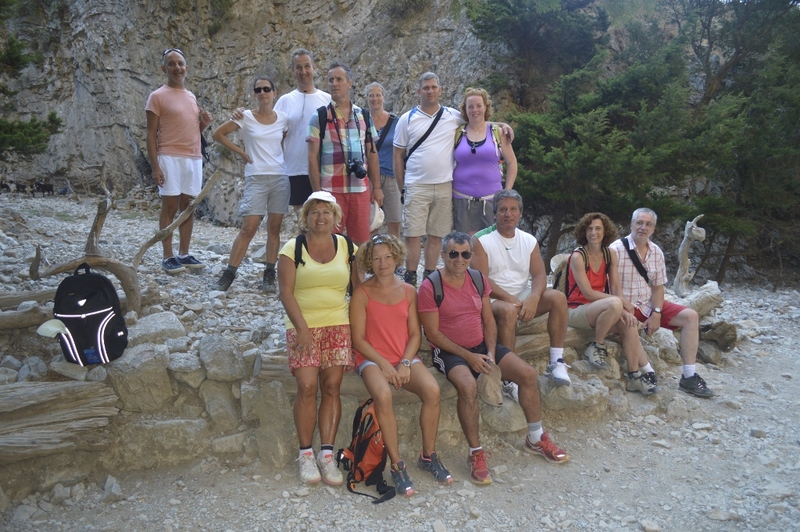 Group Photo inside Imbros Gorge! A morning ride through a beautiful forest and a windy road gets us to Imbros gorge entrance. A cool air breeze at 780 m makes the walk easier and during the different seasons one can notice different flowers blooming. Dragon Lilly and delphinium in spring, wild mint and sea squill in autumn are some of these! An easy, but still requiring good shoes, 2,5 hours walk downhill. Have an apple with you for the donkey we might meet on our way down and enjoy nature’s scents and views! Excursion At Pachnes – 2456m Above Sea! 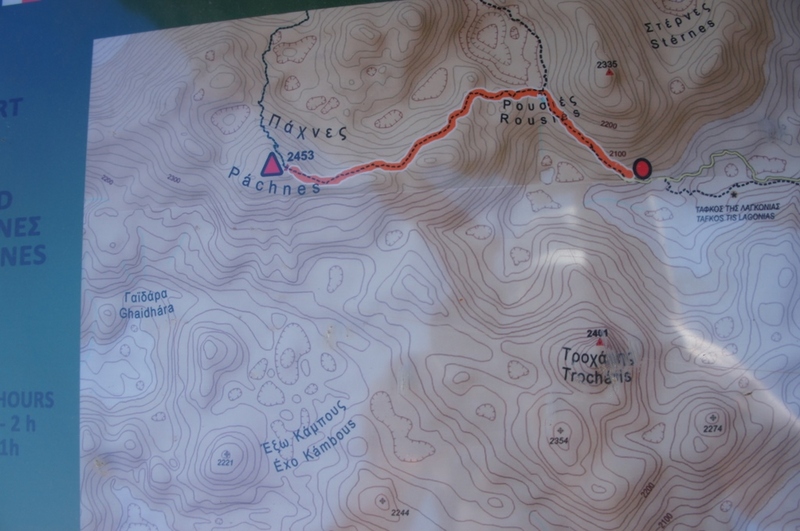 Pachnes is the highest mountain summit of Crete (2456m) according to the latest satellite measurements and it is certainly a place you must visit if you are interested in hiking. The way to Pachnes through Anopolis and the pine tree forest ends after a 2-hour hiking trip. The sea of mountains as described by our guests, the lunar landscape… and the views of Cretan and Libyan sea create a breathtaking view! The wildest, most impressive gorge of the municipality. A Bailey noisy bridge brings us to the village of Aradena, which was abandoned after a vendetta. We walk down the walls of the gorge and the adventure starts. Eight more challenging vertical passages. Red colored walls, wild goats and herbs scents. The spectacular scenery is completed as soon as Gryffon Vultures show up in the sky… Time for a drink or a Sfakian pie with the view of the clear blue sea and marble rock caves! 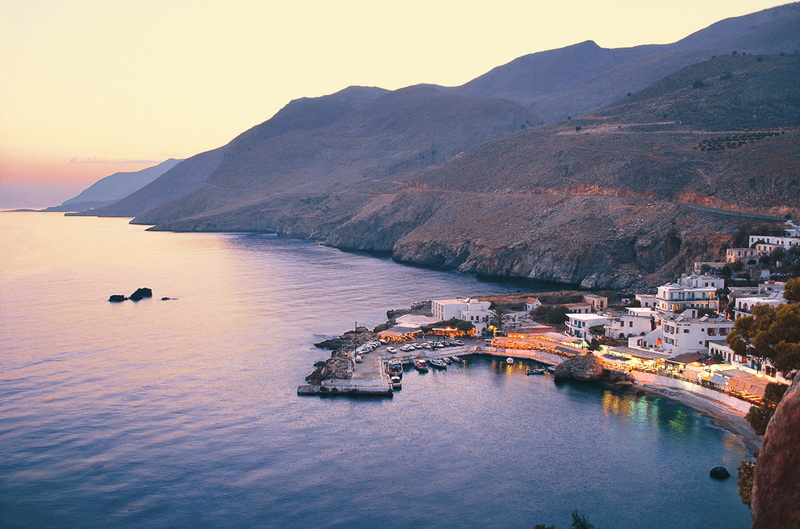 We start on Thursdays at 8.00 from the hotel and our first stop is Loutro where we have some time for a drink. Afterwards we take the path and after 1 hour walk, enjoying the endless blue sea and sky, we arrive at Sweet Water beach. Sweet Water beach has springs of fresh ice-cold water coming straight from the White Mountains. The eastern part of the beach is naturist and there are Tamarix trees offering shade as well as umbrellas and sunbeds for rent. The tavern offers a variety of drinks as well as delicious food! We return with a private boat and we are back at the hotel around 12.45.